They taste faintly of zucchini, only sweeter. Thriving zucchini plants have at least three male blossoms for every female bloom. When the pollinators have completed their rounds, fertilized female flowers fade as they bear fruit. Then there’s not much left for the males to do. Well, except to be eaten, that is. 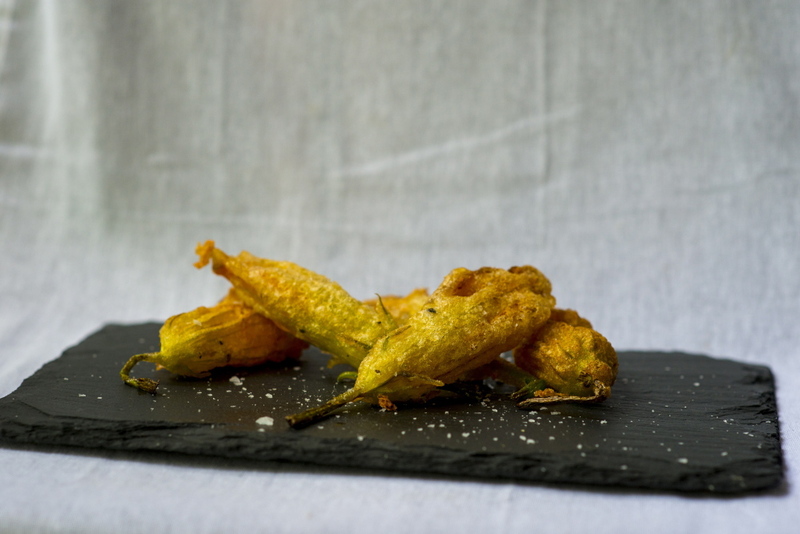 They taste faintly of zucchini, only sweeter, and are rich and velvety. Mediterranean and Mexican cooks tap these boy blossoms for flavor, frugality (using every part of the zucchini) and culinary flourish. In Mediterranean cuisine, they are stuffed with fresh mozzarella and salty (sustainable) anchovies and fried; in Mexico, they’re often sautéed with chilies and layered inside quesadillas with Oaxaca string cheese. You can also chop them into frittatas and cut them into bright yellow-orange ribbons for salads. How do you tell the male blossoms from the female? First, check the stem. Male blossoms have a long, slender stem; the female stem is shorter. Secondly, look at the point where the petals attach to the stem. Male blossoms have only a slender stalk, while female blossoms sport a small, bulbous area that houses the ovary, which will grow into the fruit once it’s fertilized. Lastly, male blossoms have a stamen in the center of the flower. 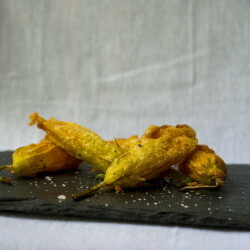 Zucchini flowers are best picked the day they will be eaten, in the morning. They tend to be closed then, so there’s less chance of bugs hiding inside. Keep them refrigerated, taking care not to crush them. Just before cooking, remove the stamens, which are bitter. I use a pair of kitchen tweezers, but if you have small fingers, reach inside and pinch them off. Give the blossoms a good shake for bugs and brush the outside with a dry paper towel, if you must, but don’t wash them; water makes them wither. You’ll likely need a local source – perhaps a local farmer, though you may need to order blossoms in advance of market day. At the Brunswick market, I pay about $1 per blossom. If you cull blossoms from your own garden, leave a few males in the patch. A late-blooming female might need him for another purpose. If you don’t have a candy thermometer, you can dip the tip of a wooden spoon in the oil to see if it is hot enough for frying. If the oil bubbles around the spoon, the oil is ready. 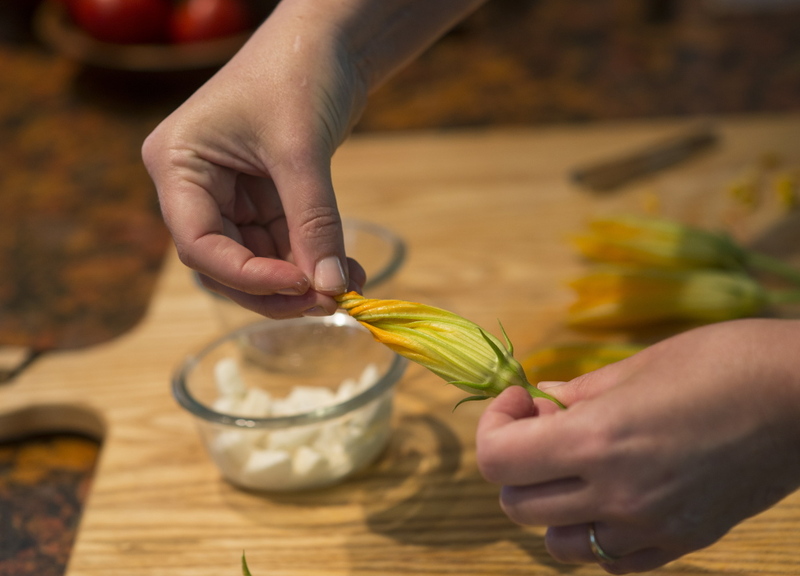 Prep the zucchini blossoms by carefully removing the stamen from the center of each flower. Slice each mozzarella ball in half. Quarter each anchovy fillet. Stuff 1 piece of cheese and 1 piece of anchovy into the center of each blossom. 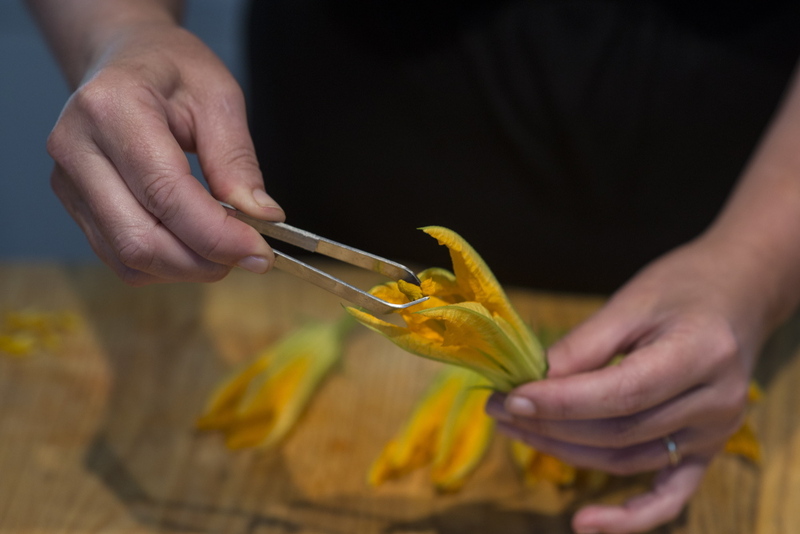 Gently pull the leaves forward and give the ends a slight twist to help keep the stuffing inside the flower while it’s fried. Repeat this process until all the blossoms are stuffed. Pour oils into a 3-quart pan. The oil should come no more than ⅓ of the way up the side of the pan. Place the pan of oil over medium high heat. 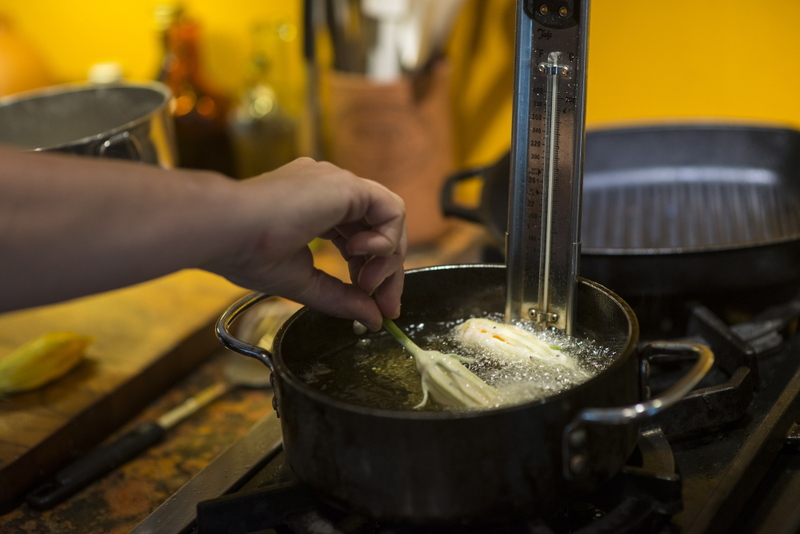 Use a candy thermometer to gauge when the oil reaches 375 degrees. Set up a baking rack lined with paper towels on the counter next to the stove. In a medium bowl, whisk together flour, cornstarch (or white rice flour), baking powder, salt and pepper. Slowly whisk in the sparkling water until the mixture is the consistency of heavy cream. When the oil is hot, dip 1 stuffed blossom into the batter, then immediately lower it into the hot oil. Repeat until all the flowers are fried, taking care not to crowd the pan; you will have to cook the blossoms in batches. Cook the blossoms 2-3 minutes, until they are puffed up, crisp and golden. Use a slotted spoon to move them to the rack. Sprinkle the blossoms with coarse sea salt as soon as they come out of the oil. Serve immediately.